JST: Translation or Something Else? One of the most important facets of Mormonism that sets us apart from other faiths is that we don’t believe the Bible to be inerrant. We believe that it contains errors. This belief alone causes us to be viewed as unChristian by many evangelicals and other sola scriptura believers who consider any alteration of the Bible to be heretical. Reformists, in breaking with the Roman Catholic church’s authority, placed greater weight on scripture as the sole voice of God (not through the filter of papal authority, but accessible to all believers directly through reading the Bible). For some, if the Bible is fallible, then Christianity has no leg to stand on in proclaiming it has access to God’s truth. When I was young, I remember thinking of the Joseph Smith Translation as an actual translation, only done through direct revelation rather than research and linguistic analysis the way other Bible scholars try to improve the translation of the bible that we have. Now I’m not so sure that’s what it is. There’s reason to ask what Joseph thought he was doing, what he was actually doing, and how he arrived at his conclusions in making corrections to the text. Since the JST was not finished, we essentially use it as Biblical commentary (although it is seen as authoritative on par with greek translations defined in the commentary); the JST appears alongside other translations, cross-indexing, and topic guide links, to enhance our reading of a passage. It is not a complete re-translation of the Bible, and it uses the flawed King James Version  as its starting point. 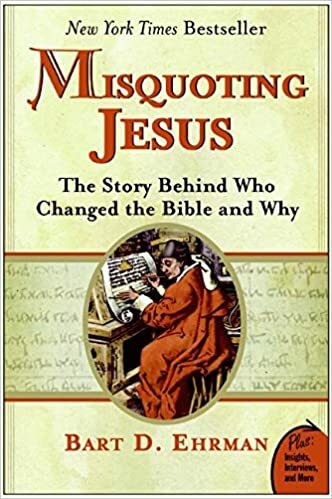 I’ve recently finished re-reading Misquoting Jesus by Bart Ehrman. He talks a lot about the evolution of Biblical scholarship and his own epiphanies as a former evangelical Christian learning that his views of Biblical inerrancy were uninformed and naive. He describes the struggles among translators throughout the ages to find the best, most “original” sources of the Bible given the process by which books were written, copied, modified, and stored. His book is a great resource for those of us raised on the foundational idea that because the Bible contains errors, we have to rely on more direct sources of revelation. We believe the Bible to be the word of God. as far as it is translated correctly; we also believe the Book of Mormon to be the word of God. Why did he believe it contained errors? Because his own revelations contradicted it at times. Copies available to later “translators” may not have been the most original or best translations–just what was conveniently available at the time. Better or earlier copies may have become available later through discoveries. Some copies were made from verbal dictation; some by visually looking at a copy and handwriting a new one. Professional scribes were used to transmit texts using a copy. These professionals were educated, but might modify texts to clarify meaning or to contradict emerging heresies. They also made some errors that were simple mistakes: missing a line of text, misreading something in copying it, or mistaking a similar word for what was written. These errors were then copied by later scribes. Scribes also sometimes added marginal notes that were later adopted into the text. The earliest Christian scribes were members of congregations, not professional scribes, who simply knew how to write. In some cases, their “writing” skills meant they could copy the words but not actually understand them. Oral traditions that pre-dated any of the four written gospels. Since the earliest documented gospel was many decades after the death of Christ, that means that these stories were likely passed down through stories shared among believers. Different congregations may have shared the same stories differently or used them for different purposes. Details may have been added or omitted to make a point. Harmonization. When scribes encountered passages that had conflicting accounts, they tried to minimize differences by removing problematic details. Some attempted to fully merge all 4 gospels into one super-gospel which was not possible since details conflict. However, scholars agree that the more problematic text is likely the more accurate because it’s more likely that a scribe would create an “easier” reading than a “harder” one. Scribes tried to smooth over difficult passages. In fact, the more amateurish the copy, the more likely it is older and closer to the original since scribes add polish to a rough text. Pseudonymous letters. Early Christians would sometimes write letters and attribute them to authority figures (such as the apostle Paul) in order to add weight to their views. Similarly, contemporary Mormons might quote general authorities, even if this means taking something said out of context, in order to make a point; however, pseudonymous writing goes further by attributing a document to someone who didn’t write it. This wasn’t done to deceive intentionally so much as to correct perceived doctrinal errors in specific congregations. It was a standard practice during a time when very few people were literate and authenticating documents was mostly impossible anyway. Apologetics. The letters of Paul are apologetic in that they were written to defend doctrine against heresies that were beginning to occur in some of the branches of the early Christian church. As such, they applied to a very specific context and time. Interpretation of scripture. Some of the New Testament is an interpretation of the Old Testament. Christ’s words are often talking about a scripture known to the Jews and then giving his spin on it; this was a unique feature of Christianity, that Jesus’ interpretations superseded the Jewish texts themselves. Paul continued this tradition of creating scripture by interpreting prior scripture in his letters. Ultimately, as Ehrman points out, we don’t have any originals. They don’t exist. Even if they did exist, they were still written decades after the events took place or using flawed methods such as Paul giving a ghost writer a rough outline and telling him to fill in the gaps. The Bible began to appear to me as a very human book. Just as human scribes had copied, and changed, the texts of scripture, so too had human authors originally written the texts of scripture. This was a human book from beginning to end. It was written by different human authors at different times and in different places to address different needs. Many of these authors no doubt felt they were inspired by God to say what they did, but they had their own perspectives, their own beliefs, their own views, their own needs, their own desires, their own understandings, their own theologies; and these perspectives, beliefs, views, needs, desires, understandings, and theologies informed everything they said. I’ll end with another great quote by Ehrman from the foreword of his book. He talks about his professor of Greek at Wheaton, a Dr. Gerald Hawthorne, who was a committed Evangelical Christian but one with views that initially shocked Ehrman as a student. He was not afraid of asking questions of his faith. At the time, I took this as a sign of weakness (in fact, I thought I had nearly all the answers to the questions he asked); eventually I saw it as a real commitment to truth and as being willing to open oneself up to the possibility that one’s views need to be revised in light of further knowledge and life experience. For all his flaws, Joseph was a seeker. But most people struggle to be seekers, to try to determine for themselves the meaning of life or their own purpose or God’s will or what is right and wrong, even in gray situations. Most people prefer to outsource authority to a book like the Bible or an authority figure like a prophet or Pope rather than wrestle with meaning themselves. It’s easy enough to see our own limitations and sometimes easier to defend someone else’s authority (or the authority of the Bible itself) as not possessing the flaws we know our own understanding contains. On the flip side, for some it’s easy to pick apart the flaws of others when they are apparent without trying to do the heavy lifting ourselves; it can be overwhelming to try to sort through the errors of a two-thousand year old book. Joseph could have simply noted the errors and not attempted his own translation. Instead, he picked up a quill and went to work. Maybe that’s the best any of us can do. Flawed because it was based on hastily done faulty translations done in the 11th C. Superior copies of the gospels that have subsequently become available illustrate many errors in the KJV. If he could only see how that turned out. As always, very insightful, Angela. Like you, I probably started out thinking of the JST as a literal translation of some ur-text, but I don’t really remember that time: When I was fourteen or fifteen, as someone described to me how the JST actually happened — Joseph was just reading the Bible and getting revelation on it, there were no plates or papyri or anything of the sort — it dawned on me that when Joseph says “translation,” he usually means “carrying forward a specific meaning” more than “keeping to the words of an original text.” Ah, the blessings of being Mormon and not worrying about sola scriptura — such an idea of non-literal translation (revelation) bothered me not in the least. I suspect that is true of many of us, although some might be initially bothered by it. In response to the OP’s title question, in recent years, I’ve adopted the idea that the JST should be taken just as it is: commentary, the words of a learned rabbi enmeshed in the footnotes of the authoritative text. The fact that we do not, for example, print a JST Bible suggests this is the way that the committee on the 1980 scriptures thought of the JST. I think this thought might not be well received by all Mormons, however, given that many of us want to think of the translation process as a pure, easy, clear transmission of God’s infallible word from heaven to earth. Relatedly, there is a sense among many of us that the prophets are less role models in our own spiritual journey than the safe transmission system of the tools we need to have our journey — i.e., that we should not follow Joseph’s actions so much as use his words to pursue a very different, less inspired journey. I wonder, then, if we don’t accidentally fall into the same kind of position that Ehrman has to work against among the Evangelical community about the fear of scripture being an at least partially human process, and if so, what you and others think about that. Personally, I am tempted to keep my thoughts to myself so as to avoid accusations of “steadying the ark,” even if that means a (much much) less healthy Mormonism overall and makes me feel spiritually stifled. What’s the point of trying to help if it’s going to be perceived as a threat? It neither improves the situation for the intended receiver of help nor allows the giver of help to participate as a responsible member of the body of Christ. Does Ehrman have thoughts about this problem? Thanks for the post. I have used the JST (published as the “Inspired Version” by the Community of Christ) my entire life. Yes, even now in the LDS Church, and I’ve never suffered any reprimands for doing so. I even gave a Sacrament talk about the JST. Was the JST completed? The accurate answer is Yes AND No. Not every intended correction had been made (Malachi 4: 5-6 are the same as the KJV) but enough had been done that Joseph was contemplating its publication. Speaking of complete, the LDS footnotes/appendix on the JST aren’t complete (the Lord’s Prayer; Matthew 6: 9-13 among others). An excellent reference book is “Joseph Smith’s “New Translation” of the Bible” by F Henry Edwards. It’s a parallel column comparison of the KJV and JST verses that contain any type of difference; as well as the added verses. Perhaps Joseph’s realization that Biblical material in the Book of Mormon translation was worded differently intrigued him. Whatever the reason, Bruce R. Mcconkie called it “one of the great evidences of the divine mission of Joseph Smith”. Edwards writes that, in studying the JST with other versions, “we come close to having Joseph Smith at our elbow to explain the points of difference which we find there”. One of the effects of the JST was to further establish members as being part of something special and by association, special themselves. For me it didn’t add that much in terms of truth but because he did it and was the prophet all the more reason to belong. I’m not a student of the JST and would be interested in just what significant points of doctrine were made plain by his writing. It has to be more than pointing out that God doesn’t have to “repent” to be that worthwhile. Given the numbers of errors in the KJV to start with, he could have started their. I think it is a good comparison for JST to be compared to other study helps, like footnotes and cross-references and other study helps. It raises and interesting point…that scripture can be tweaked by modern prophets. But it is curious that we also criticize those who tried to do that very thing. Joseph Smith would not have had the words of James to prompt his actions had it not been for efforts of people to write those and then translate to english…and yet…we seem to be critical of any translation that didn’t come from someone who had restored priesthood authority to do so. It’s a bit circular for our religion to believe on so much of it, and yet claim to have authority to add to it that others do not correctly have. We seem critical of others who say, “A bible, a bible…we have one and don’t need more.” And then we kinda say, “We have the book of mormon and modern prophets…other things don’t measure up to those things Joseph Smith did” (which also haven’t really been done since Joseph Smith). I like studying about what translation is. It seems very open to lots of things…as we seek to find God and his words. But…at the end…do we really know what Jesus said? Or are we just accepting we got the gist of the message? Diving into this topic can unravel a lot, which can be scary. I’ve come to believe that it makes no difference if the Bible is a 100% true account of God’s interaction with his people. It is definitely a set of accounts of what some thought it was. There is much good to learn from it, no question about it. My wife and I are reading Deuteronomy. Like Leviticus and Numbers, there is some very strange stuff in there especially about how men treat women that even the most die-hard misogynist might have an issue with. If you can even figure out what they are trying to tell you. The JST, in my mind, was just Joseph’s attempt at reconciling the scriptures with what he was learning and trying to eliminate contradictions. We all do that for ourselves all the time. My questions center around two key areas: Why those books and not others and why does Paul play such a prominent place in the New Testament, given his place as a 2nd generation Apostle? If that is translation, was that also what was happening with the production of the Book of Mormon? I don’t think so. I think the Book of Mormon “translation” was in another category. I don’t think everything presented as revealed from God is equal. For example, we believe that priesthood blessings are supposed to be, at least potentially, revelatory. I think it’s pretty much accepted that most aren’t, at least not entirely. Most priesthood blessings I’ve heard are filled with statements that are generally true (eg., “Your Father in Heaven is aware of you and your circumstances and hears your prayers”), and which the Spirit might confirm in a big way to the people present, but which aren’t necessarily revelatory. Some statements I’ve heard in priesthood blessings just don’t ring true to me at all, and yet, I’ve no reason to doubt the worthiness or sincerity of the person giving the blessing. I assume that they just didn’t have any guidance from the Spirit but let their mouths run anyway (yeah, I’ve done that too). But I’ve also heard priesthood blessings that have given some fairly remarkable insight and even a little prophecy, and based on the spiritual kick that’s accompanied them, I feel they’re not in the same category as your typical blessing. I suspect JS’s revelations probably have a distribution into those three categories as well, and I personally feel like the BOM translation was a much more revelatory experience than the JST. Having read up on this, it occurs to me that we should have a little more humility about our (or our leaders’) ability to understand scripture. Every act of revelation is also inherently an act of interpretation. There is no such thing as pure divine communication. We are still human, after all. Hawkgrrrl- Beyond writing an excellent post, I found your final paragraph moving, inspiring and had the final words to the post been “mic drop” I think that would have been justified. I love how you point out the real struggles of contradiction between scholarship and preconceived notions. The temptation to walk away scripture or turn away from new scholarly developments or pick up a pen and follow Joseph. “In this lecture, Samuel M. Brown argues that the Book of Mormon hoped to save the Bible from things like religious voluntarism and the resulting interpretive chaos, from cessationist denial of miracles; it sought to make the Bible credibly American, to make evidential Christianity internally consistent. The Book of Mormon seemed to anticipate higher criticism and the threats posed to the Bible by late modernism. As such, the Book of Mormon is a crucial text of transitional readings of the Bible. It is a lens through which to view changes in biblical authority and interpretation. Completely agree with your post! Thanks for the link. Footnote noted. 😦 Your lips to God’s ear. To me, both major volumes of Scripture (all three, I guess, including the D&C) demonstrate the difficulty humans have in hearing, accurately recording, comprehending, and following the will of God. They also demonstrate the importance of doing our best, of learning by mistakes, and of progressing. In other words, they testify of the probationary test we’re all taking. Since I’ve begun to understand that and see myself as a work in progress, I’ve cut myself and others a lot more slack. I don’t want to get us off on a tangent, but this is real proof at how hard it is to overcome our own desires and deliver a message that God might have for that person. I see the parallel in the scriptures. When it is boiled down, most scripture is a chronology of what God wanted His people to do and mostly what they DIDN’T do and how it affected them adversely. How good it was when they did and how short-lived it usually was. Jason, the lecture was fantastic. Hopefully they’ll upload a transcript of it soon (I only caught half of it. ).